FREE SHIPPING OFFER: This offer does not apply to orders placed outside the contiguous 48 states. If your order is shipping outside the contiguous 48 states, you will be contacted with a shipping quote.  Compact Design  Locking / Easy-slide Drawer  Black, Aluminium Framed Construction  Great For Counter Tops Or Portable For Travel  Storage Case Includes: 200 Plastic Disc Sleeves, Hold Up To 400 Discs. CD, DVD, VHS, AUDIO & MEDIA STORAGE CABINETS Make more use of valuable display space with our compact and stylish storage cabinets. 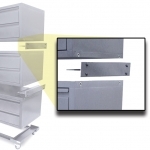 Each drawer glides smoothly to full extension. 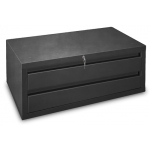 Easy to form a counter-top for fast, efficient access to merchandise. Stack a 2-drawer on top of a 3-drawer and you have a normal workspace height. Stores VHS tapes, audio tapes, CDs, computer supplies, DVDs, books and magazines. 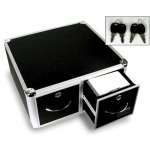 Storage cabinets include locking system for greater security at no extra charge! Colors: Beige, Gray, White and Black. Ships assembled. Dividers and mobile caddy sold separately. 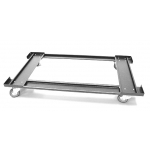 Mobile Caddy Our heavy duty mobile caddy is great for transporting cabinets to and from various locations.